Many people think of national parks as pet-prohibitive, but many are actually quite dog-friendly. A handful of parks throughout the West allow pets on select trails and have safe pet accommodations for owners who want to explore without their animal. 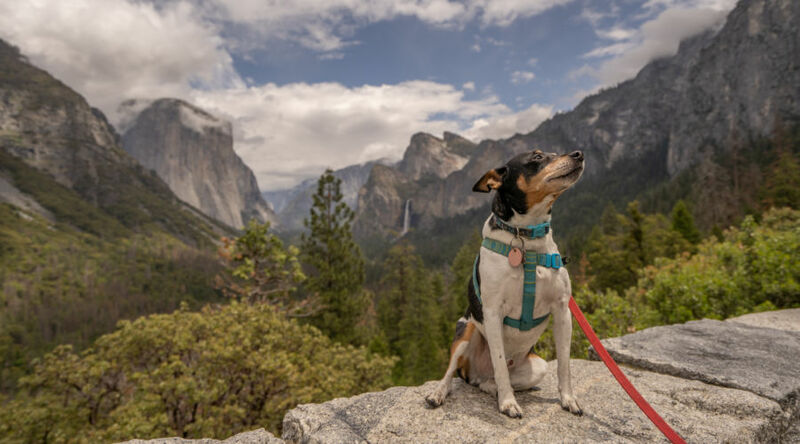 It might come as a surprise, but dogs are allowed on many of the paths and campgrounds throughout one of America’s most-visited parks. Specifically, you can walk your four-legged friends in developed areas, as well as on paved roads, sidewalks, and bike paths. Dogs-friendly camping can be found throughout the park, except at walk-in campgrounds and group campsites. Don’t forget to keep your fur baby leashed, pick up after them, and never leave them in a car. The Grand Canyon offers many fantastic options for travelers with pets. On the South Rim, leashed dogs can hike any trail above the rim. The North Rim is stricter, with dog access limited to the greenway that connects the North Kaibab Trail and a portion of the Arizona Trail. If you’re hoping to explore dog-restricted areas, you can park your pup at the Grand Canyon Kennel for the day (they accept cats, too). The park offers several great pet-friendly hotels. Animals are welcome at Mather Campground, Desert View Campground, Trailer Village, and Yavapai Lodge. Experience one of the most beautiful sections of the Pacific Crest Trail with your pup. Dog-friendly hiking can be found on an 18-mile section of the PCT through North Cascades National Park. Pets are also welcome in many of the park’s surrounding recreation areas, like Ross Lake and Lake Chelan. Zion National Park offers one excellent hiking trail for dogs, the 3.5-mile Pa’rus trail. Dogs are also allowed in all developed areas of the park, like paved roads, campgrounds, and picnic areas. If you want to explore the park without your pet, animals are allowed to remain at your campground if they are properly restrained (and if the weather conditions are safe). Remember, Zion gets incredibly hot, so always keep your animal cool and hydrated. Almost all of Great Sand Dunes is open to pets and their owners. The only places you can’t bring your four-legged friend are the backcountry, backpacking sites, and off-trail areas. The park does present a number of dangers, though, like hot sand, cactus, and wild animals, so be cautious. Dog visitors are actually encouraged here! Pets are allowed anywhere in the park—roads, trails, and the wilderness areas. The visitor center even offers an honorary “Bark Ranger” dog tag. Dogs are allowed on a number of trails and beaches in Olympic National Park, including Peabody Creek Trail, Madison Falls Trail, Spruce Railroad trail, and July Creek Loop Trail. You can also get sandy with your pup on the dog-friendly beaches between the Hoh and Quinalt Reservations in the Kalaloch area. Pets are welcome in campgrounds, picnic areas, and paved and dirt roads. Pets are allowed everywhere in this 275-square-miles park of gypsum dunes. Like at all other parks, pets must be on a six-foot leash and owners must pick up after them. Outside of the West, Acadia National Park, Shenandoah National Park, and Cuyahoga Valley National Park all offer several dog-friendly hiking and camping options.